Ok, I realize this is not a pretty picture. Believe me, I do. And I also realize it's not the prettiest color. However, I doubt anyone could make an appealing color out of balsamic vinegar and tomatoes. Brown and red? Yeah, not the greatest combination. But who cares? When a dish tastes as good as this, it really doesn't matter. Not only am I obsessed with balsamic vinegar, I am also obsessed with the taste of it when mixed with tomatoes. Seriously, the flavors were meant to be with each other. The flavors are so rich and deep - people will think you slaved away in the kitchen. But I assure you, this is anything but complicated. You should know me well enough by now that I don't make tedious recipes! I hope you'll look past this picture and give this recipe a try. It's definitely a keeper in the Ice Cream & Wine household! Oh, and the following recipe serves 6; I cut it in half and used three chicken breasts. Season cubed chicken with pepper, garlic powder and salt. Heat olive oil in a medium skillet over medium heat; brown the onion and cubed chicken. 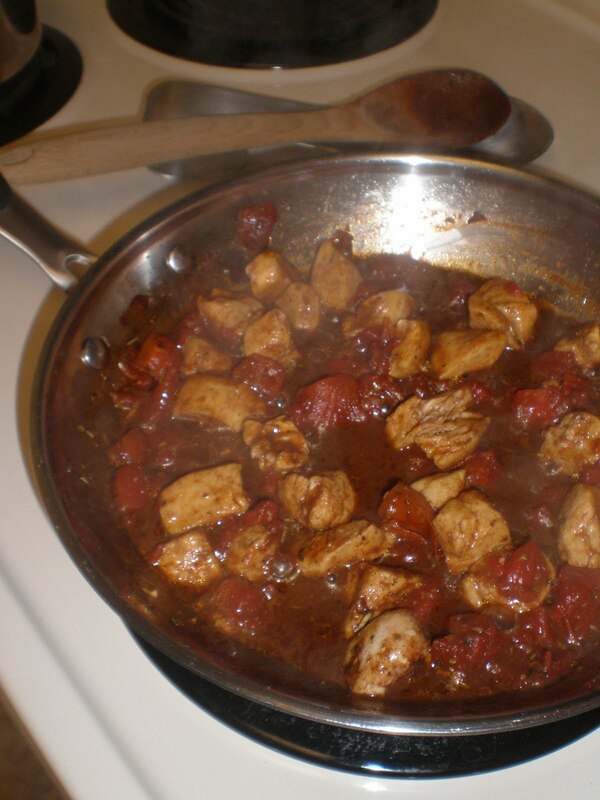 Pour balsamic vinegar and tomatoes over the chicken & onion mixture. Season with the remaining ingredients. Simmer until the chicken is no longer pink, and the juices run clear - about 15 minutes. Serve over brown rice or angel hair pasta.